In my last post I detailed the list of things I hoped to accomplish this year in my home. The making of the list was prompted by the Apartment Therapy January Cure. and I though I’d give you a wee update. Last weeks tasks started off pretty well. After I made my list, and started my outbox I made good use of the rush of energy that comes with the start of any project, but by the end of the weekend my enthusiasm for this month-long project had dramatically decreased. 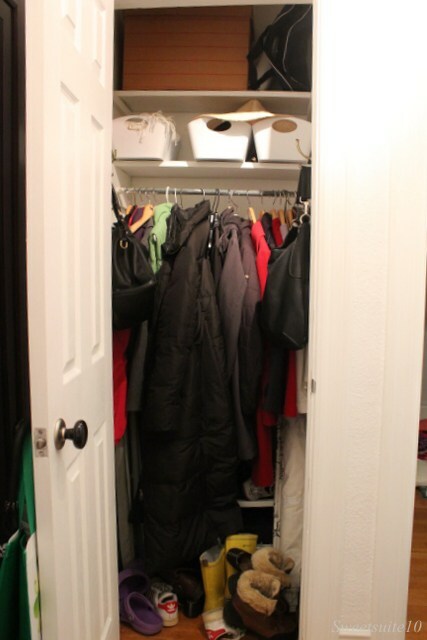 First up – my front hall closet. Honestly my closet wasn’t too horrific, so it only took about 30 minutes to get this task complete. 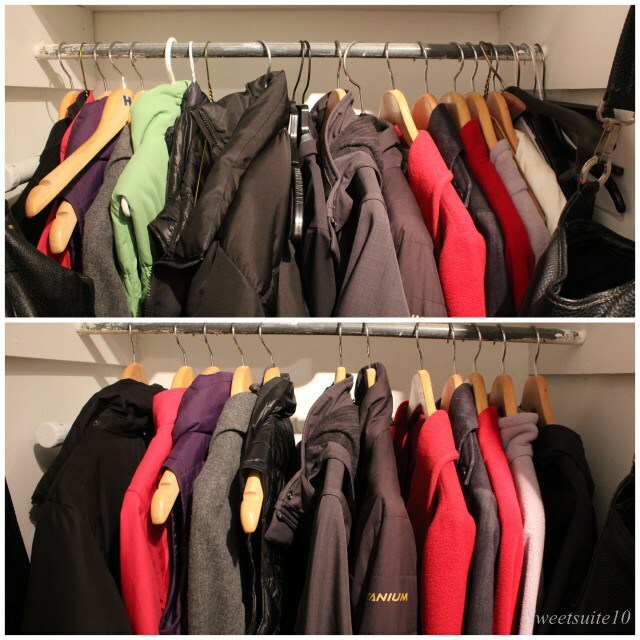 I’m a BIG believer in using all the same hangers (preferably wood ones – Ikea sells packages for a good price, and so does Homesense) - this by default will make your closets look neater, so I was a bit dismayed to find some other types of hangers when I opened the door and really took a look. Woohoo! Cleaning is making me money! Next I moved a few steps over to get started on my linen closet. I opened the door, and then was completely and utterly overwhelmed. Take a look - see overwhelming (I can't believe I'm sharing my disaster with the world). I decided to take the easy route and started on my actual linens. I pulled everything out and discovered I had an awful lot of sheets for a home with only 1 bed. I also discovered I had a whole selection of never opened new sheets and pillowcases at the bottom of the big pile. I ended up adding about half my old sheets to my outbox, so that section of my linen closet is looking a lot better. When I looked at the rest of my closet I lost my organizing mojo, so it will have to wait for another day. The tasks for the weekend were three fold – I was to mop my floors, buy green cleaning products, and buy myself flowers. If you’ve read this blog for a while you know I don’t have any difficulty buying myself flowers so that task was easily completed. I was less successful with the other two. I only managed to mop three rooms – my living room, the kitchen and the bathroom – my bedroom and dining room currently have random piles of stuff everywhere that I need to find homes for, and I was too lazy to move them to mop. The last task for the weekend was to buy new ‘green’ cleaning products. I already have cleaning products, and while they may not be ‘green’ I can’t see the point in buying new stuff until I need some – wouldn’t throwing out what I already have be just as bad for the environment as using it? Other than buying some toilet cleaner (because I needed it) I’m putting this task in the ‘not completed’ column. I will commit to buying green products from now on, so this task will eventually migrate over to the completed column. I case I’ve given you the impression I didn’t accomplish much, by the end of the weekend my outbox had become 4 boxes, one table, a computer monitor and a bag of clothes, and instead of leaving it all to languish in boxes in my living room (which is a classic Michelle thing to do) I actually hauled it all out of my house and donated it – Yay me! 4 full boxes, a computer monitor, 1 bag of clothes and a table all donated yesterday. The @AptTherapy #januarycure is working! 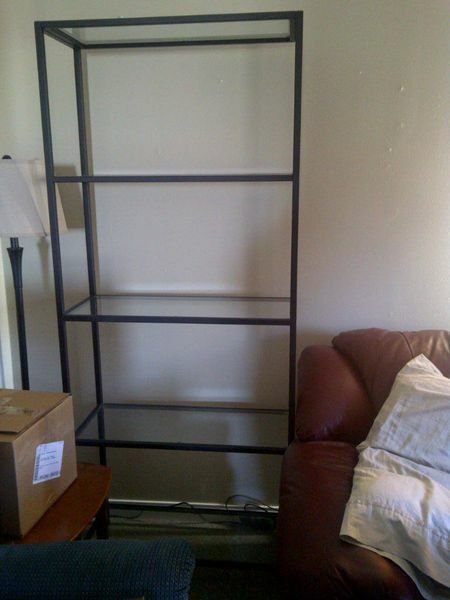 I also drove out to Oshawa and picked up this Kijiji bookcase which will help me with the ‘get more storage’ item on the list of tasks for my living room, and I’ve decided it will be the project I commit to completing this month (Picking the project was the task for day 5). I really want to paint it (it’s currently black and rather institutional looking), but spray-paint is out since it’s winter, so I’ll have to come up with something else. Hopefully something amazing will come to me soon since it’s already the 11th of January. Are you guys doing the January cure? Are you having any success? You're doing a fantastic job! Your outbox(s) is inspiring. I'm going to try and get rid of that much stuff this weekend. I think I'll have a lot of stuff to purge from my kitchen. I can finally get rid of my lidless tupperware collection. I'm enjoying your blog! 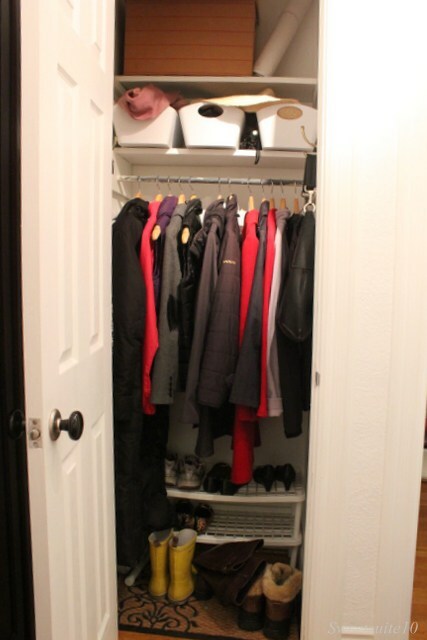 May I suggest for the front closet: move all long coats to one side so its easier to get at the shoes; get a metal shoe rack (nice upgrade from the plastic and doesn't sag) - Costco used to have an inexpensive one with 3 tiers that worked well for me. 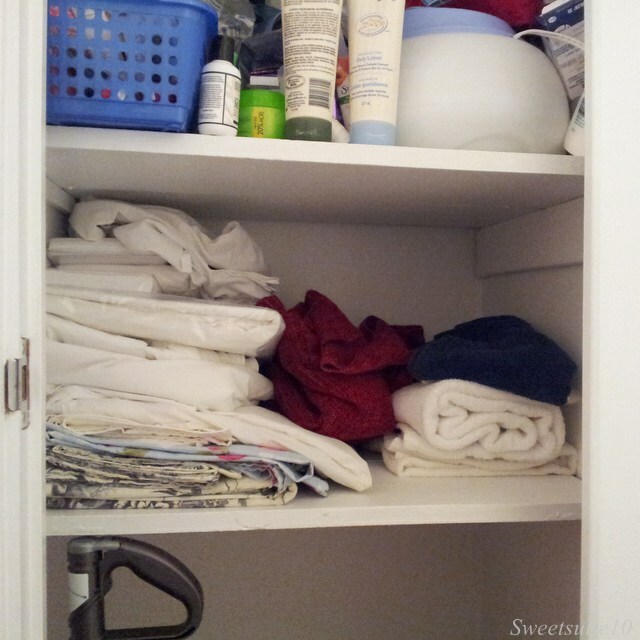 Linen closet: try rolling the towels or folding to all one size. Ditto sheets. I really admire you for doing this. 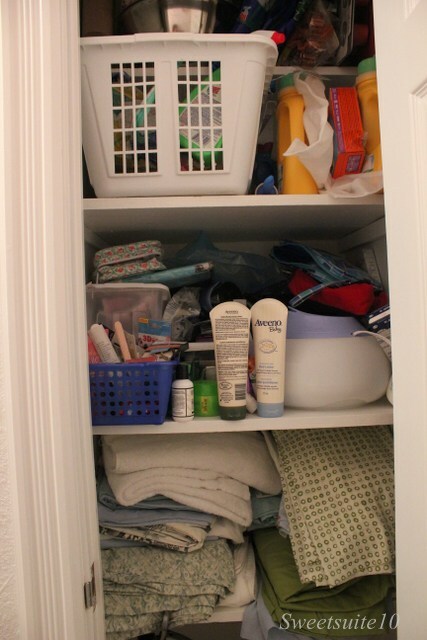 Getting organized and purging is high on my list, but I feel a little overwhelmed when I get started - too many linen closet situations to deal with! Good for you!